I still use iDVD a lot, because it’s quick and easy to spit out a DVD either with simple menus, or an as auto-play disc with no menus at all… but every now and then, I get this warning about the file being locked. 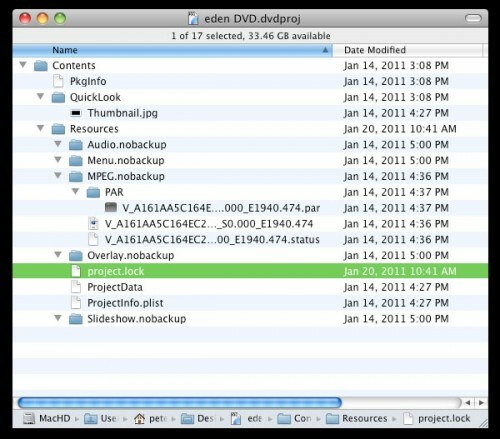 Here’s the fix: command-click on the file in the Finder, and select Show Package Contents from the contextual menu. This will open a Finder window showing you the files. Go into Contents, and then Resources, and look for the project.lock file, and delete it. That should fix it. Bonus Tip: If you want a fast way of recursively opening all folders in list view, select the main folder, and hit command-option-right arrow. Want to close them all? command-option-left arrow. Posted on Monday, February 14th, 2011 at 11:00 am. Subscribe to the comments feed. Both comments and pings are currently closed. Post on your own blog.